Sleep problems are common in childhood. A distinction is made between problems in which polysomnography is abnormal (i.e., the parasomnias, sleep apnea and narcolepsy) and problems that are behavioral in origin and have normal polysomnography. The parasomnias—sleep terrors, somnambulism and enuresis—appear to be related to central nervous system immaturity and are often outgrown. Obstructive sleep apnea syndrome (OSAS) is frequently missed in children and can often be cured through surgery. Behavioral sleep problems may be overcome after parents make interventions. Physicians can be of great assistance to these families by recommending techniques to parents that have been shown to be effective. Sleep behaviors are among the most common concerns that parents of young children bring to their physicians. A child who goes to bed unwillingly or wakes frequently during the night can be highly disruptive to a family. Sleep disorders in children, if confirmed by reproducible findings in a sleep laboratory, are not appreciably different from those occurring in adults. However, sleep problems, defined as a sleep pattern that is unsatisfactory to the parents, child or physician, are far more common. Defining disordered sleep behavior is difficult because of important differences in sleep patterns that occur at different developmental stages. Thus, it is not considered abnormal when a two-month-old infant wakes frequently in the night, but it is considered abnormal in a two-year-old child. To make the definition of sleep problems even more difficult, families vary greatly in their tolerance of their children's sleeping habits; what one family finds problematic, another family takes as a matter of course. Helping a family resolve a child's sleep problem is satisfying for a family physician and worth the time spent taking a careful history. The cause of sleep disorders is not always clear and sometimes more than one reason is thought to be a factor. Some sleep disorders are considered developmental. For example, nighttime settling issues are common in infants and toddlers, while sleep terrors and sleep walking are seen in older children. These disorders often resolve with time and require intervention only if they are particularly alarming in frequency or worrisome in behavior complexity. In other disorders, a familial component plays a strong role. These may include restless legs, bedwetting and sleep apnea. Sleep apnea in premature babies is a problem that usually goes away with maturity. This is different from sleep apnea seen in the older, snoring child, where large adenoids and tonsils, abnormal dentition, upper airway allergies, cranio-facial abnormalities and obesity all may play a significant role. Micronutrients such as float and iron seem to be important in limb movement disorders. Many other sleep disorders, including insomnia and daytime sleepiness, can be influenced by external factors such as the home and bedroom environment (TV, cell phones, electronic gaming), social stress, medications (including drugs of abuse) and even seemingly innocuous sub-stances like caffeine and nicotine. Psychiatric, neurological and developmental disorders, if present, often interplay intimately with sleep problems. Sometimes, treating one sleep disorder (e.g. sleep apnea) may benefit an-other (e.g. sleep walking). Insomnia is itself often a symptom of other problems. Typical patterns of insomnia include the inability to fall asleep or stay asleep at night, waking up earlier than usual, and daytime fatigue. Most people with insomnia don't fall asleep in inappropriate situations, like driving. If this does occur, it may signal that a medical disorder (such as sleep apnea) is the cause of insomnia. Excessive daytime sleepiness is the primary symptom. Some people will deny sleepiness but feel fatigued. Other symptoms are snoring, snorting, and gasping sounds when you sleep -- often first noticed by a sleeping partner. Restless or unrefreshing sleep is also typical, as are headaches in the morning. Excessive sleepiness during the day, alleviated by naps, can be a symptom of narcolepsy. Dreaming during naps and experiencing dream-like hallucinations as you fall asleep are also warning signs. Loss of muscle control (called cataplexy) that occurs with emotion, such as laughing or anger, and the inability to move as you're going to sleep or waking up (called sleep paralysis) are also symptoms. The primary warning sign is the irresistible urge to move your legs shortly after you get into bed, in the middle of the night after awakening, or even when wide awake during the day. It usually feels better if you get up to walk around or rub your leg. A "creepy-crawly" or twitching feeling in your calves, feet, thighs, or arms are symptoms of restless leg syndrome -- the sensations of discomfort can be quite varied. Kicking or twitching leg movements during sleep, and sometimes while awake, may be warning signs. Sleep disorders are generally diagnosed either by a pediatrician or a sleep specialist. If parents are concerned about possible sleep problems, they may want to begin by discussing their concerns with their child’s physician. Not all pediatricians recognize the variety of sleep problems children and teenagers experience, and if parents are not satisfied after meeting with their child’s physician, they may want to request a referral to a sleep specialist or to a sleep clinic. At school parents might find some assistance from the school psychologist or social worker, who may use a diagnostic interview as part of an evaluation. This interview should include questions about the child’s normal sleep patterns, including bedtime routines, typical bedtime and wake time on school days and weekends, whether the child has trouble falling asleep or staying asleep, and the frequency of nightmares. When parents or teachers have concerns about both attention and behavior problems, sleep problems may be an issue. This is because side effects associated with sleep disturbance or deprivation include inattention, irritability, hyperactivity, and impulse control problems. Different types of sleep disorders call for different treatments. Night terrors. Night terrors are sudden, partial arousal associated with emotional outbursts, fear, and motor activity. Occurring most often among children ages 4–8 during NREM sleep, the child has no memory of night terrors once fully awake. If your child experiences night terrors, make sure he or she is comfortable but do not wake the child. In extreme cases, night terrors may require medical intervention. Sleep walking. 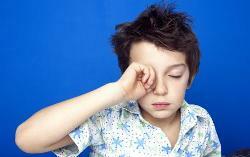 Sleep walking is most common among 8–12 year-olds. Typically, the child sits up in bed with eyes open but unseeing or may walk through the house. Their speech is mumbled and unintelligible. Usually children will outgrow sleepwalking by adolescence. In the meantime, take safety precautions (e.g., using a first floor bedroom), but keep efforts to intervene to a minimum. Awakening the child on a regular schedule can reduce or eliminate episodes. Sleep-onset anxiety. Sleep-onset anxiety refers to difficulty falling asleep because of excessive fears or worries. The problem may be caused by stressful events or trauma or because of ruminating on more commonplace issues of the day. 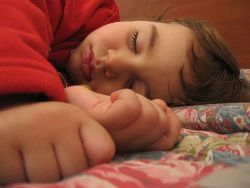 This type of sleep problem is most common among older elementary school children. Intervention strategies include reassurance, calming bedtime routines, and, in some cases, cognitive-behavioral therapy, which is designed to help children develop effective coping strategies to address their worries. Obstructive sleep apnea. Although more common in adults, 1–3% of children experience difficulty breathing because of obstructed air passages. Symptoms include snoring, difficulty breathing during sleep, mouth breathing during sleep, or excessive daytime sleepiness. In children this type of sleep disturbance is usually not serious, but most children benefit from removal of the tonsils and adenoids. When this is not effective, the condition can be treated (by a physician) with a procedure known as nasal continuous positive airway pressure (CPAP). Nacrolepsy. Nacrolepsy is a rare but potentially dangerous, neurologically based genetic condition that may include sleep attacks (irresistible urges to sleep), sleep-onset paralysis, or sleep-onset hallucinations. It affects 1 of every 2,000 adults and may first appear in adolescence. 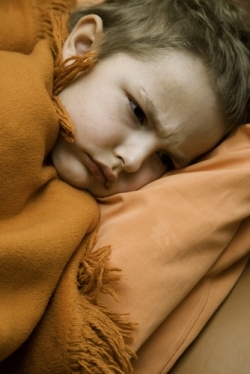 If this disorder is suspected, refer to the child to a sleep specialist. Treatment may include ensuring a full 12 hours of sleep per night or more, scheduled naps, or medication. Delayed sleep-phase syndrome. This is a disorder of sleep (circadian) rhythm that results in an inability to fall asleep at a normal hour (e.g., sleep onset may be delayed until 2–4 a.m.) and results in difficulty waking up in the morning. Symptoms among children include excessive daytime sleepiness, sleeping until early afternoon on weekends, truancy and tardiness, and poor school performance. 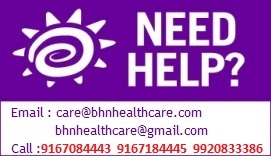 Treatment might include light therapy (exposure to very bright light in the morning), chronotherapy (gradually advancing the child’s sleep schedule 1 hour per night until a normal routine is achieved), maintaining a consistent sleep schedule, or a short course of sedative medication to help achieve a new schedule. It may be necessary and beneficial to (temporarily) adjust the child’s school day to allow for a later start.